After completing his studies at the Escuela de Artes Aplicadas y Oficios Artisticos in his home town, Sevilla, Santiago came to Milan in 1971 where, with Perry, he founded King & Miranda Associati in 1976. Before this, he designed and wrote ‘Air Mail Transatlantic Pictures’, stories and images for an interactive park for lonely people, as well as working as a consultant to Olivetti. He is active in teaching and research. He was member of the Scientific Commitee of the Istituto Europeo di Design in Madrid and of the Scientific Committee of the University Pablo de Olavide in Seville. He has participated in numerous conferences and competition juries all over the world. 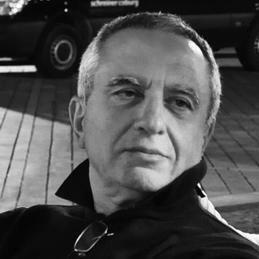 He was awarded the Premio Nacional de Diseño Español in 1989 and the Premio Andalucia de Diseño in 1995.